Well, you are the gardener of your own body and soul; the knowledge you feed your body is the water and fertilizers, which are essential for the soul, fasting and consciousness of Allah are the herbicides for eradicating desires, the metal rod is the food and drink for strengthening the healthy body. When the weak plant is well taken care of, the fruits would be loving yourself and others for the sake of Allah. We need to understand the need to fulfill “love for me”. Loving ourselves first might seem a little egotistical, but if the intention is to please Allah, to serve people and diffuse goodness merely for Him, then it won’t be egoistic at all! Why should we love ourselves for the sake of Allah? 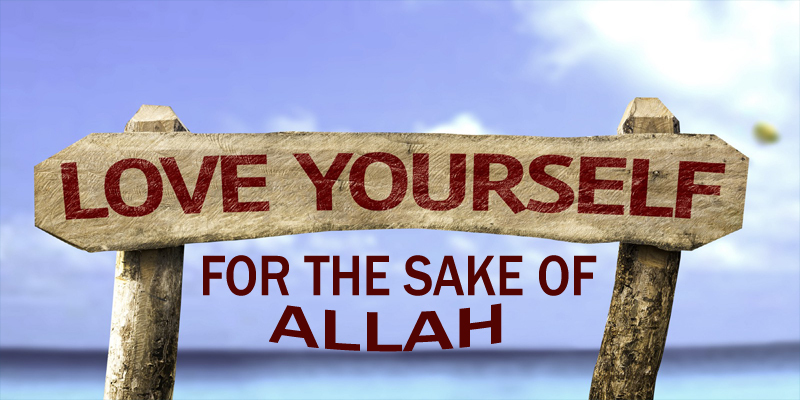 To love others, we must first love ourselves; and the more we love others for the sake of Allah, our love for ourselves for the sake of Allah also increases. Thus, it’s important to know if we love ourselves enough or not. There is a direct link between knowledge and fearing Allah, the more we gain the fruits of knowledge, the more we will fear Allah, which eventually will lead us to maximize our good deeds and build a strong foundation. Can't agree more with these lines! "There are two types of people who are unforgettable: the ones who help us in times of adversity and the ones who leave us in our downfall. "Thumps up! Am a dentist and one of our professors was highlighting the difference between superficial sympathy and true empathy the other day at hospital, and she said, "Some people fool others for "Eons" even, by their intelligent use of words..Thats how charming words can be, and when difficulty befalls a person, they further fool them with a set of a few beautiful advices, and their job here is done, as they cleverly make their way,sneaking out through the window, leaving a person all alone to himself." So she said, don't just "write beautiful prescriptions", be physically and emotionally present for your patients! Only our actions show where our priorities lie... but then, who really cares to reflect on that!